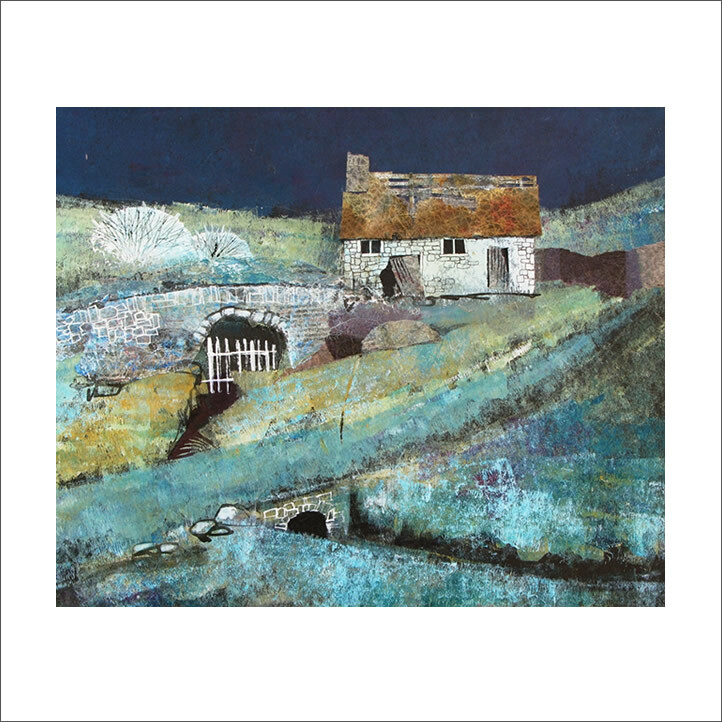 I live and work as an Artist in North Wales in my studio which is an outbuilding of our converted barn home. I taught Art as a Community Tutor for 16 years. I saw it as a sharing of ideas, with like minded people. I offered ideas and inspiration to others yet, I paved my own creative path at the same time. I began painting and exhibiting and developing my personal style. I studied Children’s Book Illustration, which taught me the importance of drawing. I attend a Life drawing class each week, I love the fact that it never gets any easier. When painting, you can be quirky, and impressionist in painting style, but it all has to hang on the drawing. I still try to maintain the discipline of using a sketchbook when out and about; it helps me to observe, to work out exactly where things go! I am fascinated by texture, from old stone walls, to fallen fences, to the ruggedness of the landscape, all create their own textural quality. I enjoy the process of experimentation. I like to encourage happy accidents, and develop results so that I can recreate them to effect. I use a roller with acylics to create a distressed underpainting on which I can work. I use rollers rather than a paint brush, because of the texture it delivers with every roll. I look for “tools” to create further texture and detail, e.g. bits of card, sponges, masking tape, collage etc. Textural quality adds interest to the piece, I like to think people may stop to look a bit closer, rather than walking by. Collaged papers are used to bring out detail, as well as homemade “tools”. Once this process has begun, hand painting is not an option, so each painting becomes a journey of discovery. That’s where, for me, the enjoyment comes in. Wirral Open Exhibition, North Wales Open, Theatr Clwyd, Chester Grosvenor Art Society Open Best in Show 2012, SAA Artist of the Year Highly Commended 2013, SAA Artist of the Year Design Centre, Islington, London- 2013, Royal Cambrian Academy Open, Helfa Gelf (Open Arts Trail) North Wales, Flintshire Visual Arts & Crafts Network Annual Exhibition (Committee Member), Staaks Gallery, West Kirby, SOTA Gallery, Whitney, Cotswolds, Chester Artfest, Patchings Art Exhibition 2016 – Highly commended, JACKSON Open ART Comp.2016 Shortlisted.